The DMT Racing Team by Marconi dominates the second half of the stage and Hovdenak cuts twenty seconds to Natalia Fischer, who continues to lead. The th stage of the Andalucía Bike Race started quickly for a brief tour of Villafranca de Córdoba. A few kilometers from the town of Cordoba bikers began with the first roads and trails that were responsible for selection in the middle posts, but not in the main group. 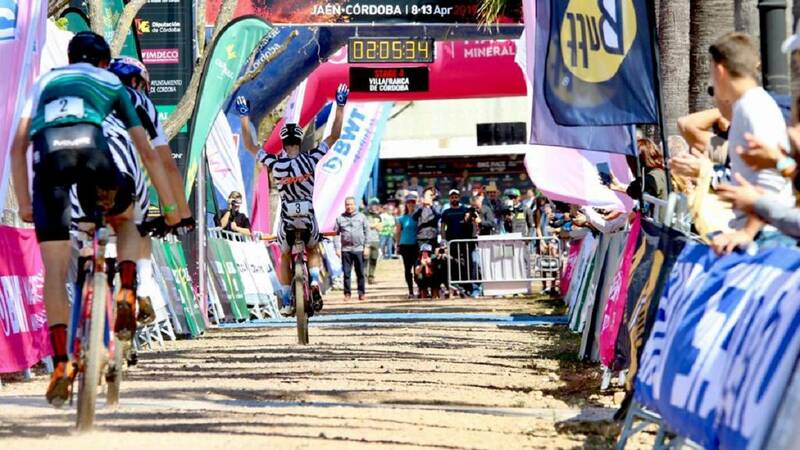 As it happened in the previous stages David Valero (MMR Factory Racing) and Tiago Ferreira (DMT Racing Team by Marconi), placed in the head of group, followed closely by the Mountain Bikers of the BUFF-Scott MTB, imponían a strong pace. The Cordovan, Miguel Muñoz, who came home at a good time he wanted to have prominence and was not separated from Valero and Ferreira. In the vicinity of the San Rafael de Navallana reservoir, before the middle of the stage, the group remained compact. In the second half of the stage the group broke up and a leading group was created with Valero, Ferreira, Beckin, Fernández, Muñoz and Sánchez, the BUFF-Scott MTB team, continued to be involved in the stage and fighting the podium. Con Villafranca on the horizon and a line of arrival in the fairground of the Cordovan town, arrived Becking, Ferreira and Valero. At the end Becking beat his teammate, Ferreira and the current leader, Valero, becoming the Andalusian leader. While, halfway through the day, in the female category Fischer did not want to roll for Over his possibilities and endured to the equator to start cutting the nearly two minutes that Norwegian Hovdenak had taken him in the first 25 kilometers. In the female category the outcome was exciting. Fischer began to feel comfortable and Hovdenak began to accuse the effort of the first part of the stage. Finally the Norwegian finished first and only 20 seconds appeared Fischer who worked very hard to continue leading. The podium was completed by Emmy Thelberg, who took third place from the start with Rosenberg.